While you wait for the game to load, enjoy reading the newspaper. A progress bar is located in the upper right hand corner of the page. When the game is loaded, a button will appear in place of the progress bar allowing you access to your Headquarters. Map icon takes you to the map page where your units are and where you will be able to issue commands to your units. Flag icon takes you to the game status page which provides information regarding you and your teamâ€™s progress through the game. Calendar icon takes you to the calendar page where turn specific information is available such as weather. Bugle icon issues your orders. Satchel icon takes you to your page containing any incoming mail. Book icon takes you to the main help page. Letter icon represents the paper, ink and pen that takes you the correspondence page permitting you to write messages to other commanders. Money bag icon takes you to the payment processing page. Newspaper bag icon takes you back to the news page. Cot icon takes you to the retire page that holds a button to quit and save your progress for the turn. The Soldier icon takes you to the Staff Report page from which you obtain information about the battles and victories as well as unit statistics. The Map Page is where you plot movements and orders for your turn. This page has all the elements you need to plot movement and dispatch orders for each of your units. The side you are playing for and the type of unit you are mousing over. The March Orders button which launches the menu for selecting your orders for a unit. The March Orders selection menu. The commander of the selected unit. The class, strength, formation, morale and current orders for the selected unit. The button to display the map legend. The map legend that exhibits unit types, formations, terrain (broken, forest, river, stream, impassible), improvements (road, railroads, turnpike, village, town, ford, ferry, bridge, forts, entrenchments), movement elements (regular, forced, zone of control) and battlemarker. The mini-map button will show you a miniature version of the overall map. The mini-map provides another way to navigate between maps in game. 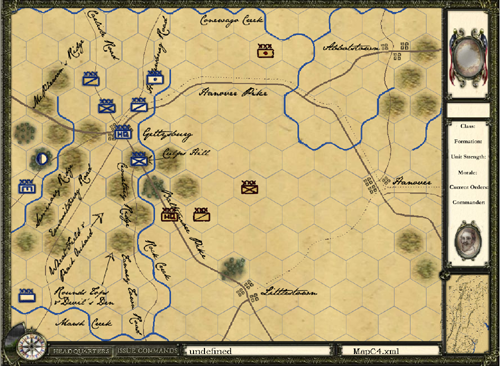 Clicking on a section of the mini-map will bring up the corresponding game map. The bottom bar of the user interface contains overall game information such as day or night turn, weather, game notices and messages as well as the map currently being displayed. The compass rose/weather marker displays the current in game weather conditions. The “issue commands” button sends your current orders to the game server (think of this as a save button). 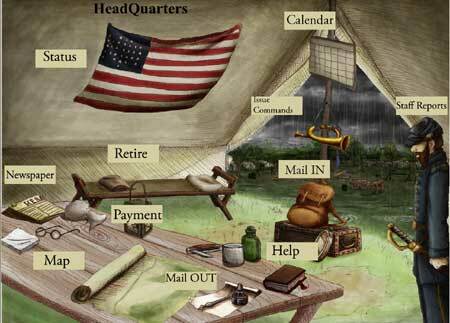 The “headquarters” button returns you to your headquarters tent (menu). The left window displays important game messages and the right window displays the current maps name. This is where you see the battles and victories per unit. 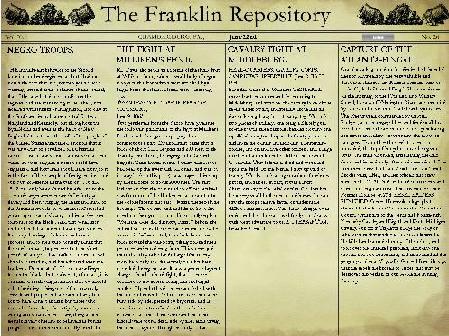 The report page contains a list of your units and displays important information for each such as strength, efficiency, morale, and engagement statistics. The correspondence page lists each letter and/or order you have received represented as an envelope. When you click on an envelope the text of the correspondence is displayed on the stationary paper on the right hand side of the screen. The Quartermaster (Money Button) links to the payment system. The status page is vital for tracking you and your team’s progress through the game. A map will show locations of major engagements. When you mouse over the engagement marker, a pop up will display battle statistics. The status bar represents both teams’overall progress within the game. This links to the game manual, the User Interface manual, instructions, and feedback forum. The retire page holds the button to quit and save your progress for the turn. The Calendar page displays the game date, current weather conditions and current game turn (am or pm). The writing correspondence page has a page of stationary on which you can write a letter or order to another player. The drop down box allows you to address the letter to the desired player character. The pen acts as a button to send your letter or order out. Letter carriers in the world of Campaign of ’63 perform with an amazing efficiency, and all letters are guaranteed to be delivered within one game turn. *A special note regarding official in game correspondence. We, the game designers, ask that players use the in game mail system for in game messages only. All other correspondence should be made in the forums or on a team page.